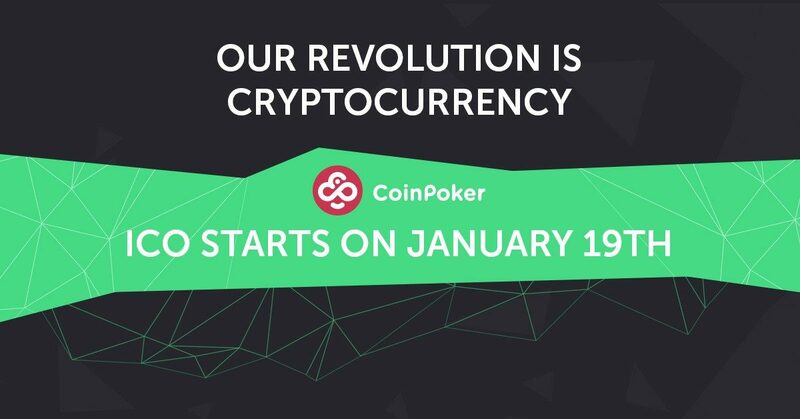 Poker players and crypto-currency enthusiasts are going to be able to take part in CoinPoker’s Initial Coin Offering (ICO) when it launches on 19 January 2018 at 10am GMT (5am US Eastern Time; 11am Central European Time). Since we know you all want to start playing immediately, you will be able to deposit your CHPs to your CoinPoker account and use them in cash games minutes after acquisition. The ICO will close no later than 26 January, depending on participation levels. If the Pre-ICO is anything to go by, the ICO could end much sooner than that! In addition, CoinPoker is launching a priority participation “whitelist” today which will enable participants to gain access to the CoinPoker ICO before the wider world is able to do so: all you will need to do is fill out the form on our website, and we’ll get back to you with further instructions. An important note is that you’ll be able to acquire CHP in exchange for various crypto-currencies. However, before our ICO starts, there are very important questions that we need to answer. As all of you know, cryptocurrencies are still in their youth and they are very volatile. Since our CHP token value is tied to Ethereum, we are affected by its fluctuations. ETH has grown substantially to say the least since November, when we launched our Pre-ICO; much more than most people could have predicted. The field we are in is very new and changes faster than we realized when we first started working on CoinPoker. While we all have been involved in the poker industry, we are doing this for the first time — and although we are working as hard as we possibly can, we knew mistakes could happen along the way. Some time ago, around November, we have answered a simple question in one of our chats: will the price of CHP change during the ICO? We said “no”. As much as we are open and straightforward with our community at any given point, unfortunately with all the overwhelming things happening miscommunication within the team is sometimes probable. We are very sorry that the case that occurred was not caught by us earlier, and it leaves us with a promise that we didn’t commit to keep — and we understand it comes as a disappointment. We still want to keep our promises to you as much as humanly possible, and at the moment, it means striving to keep CHP price as level as we can, in comparison to our Pre-ICO. Our Pre-ICO CHP tokens were sold with a 30% bonus, 1 CHP equating approximately 0.05 EUR (it wasn’t fully tied to ETH back then). At the time, we were planning to have III stages for our ICO, with the 1st one giving a 20% bonus, the 2nd — 10% bonus, and the 3rd one for the nominal price. With the bonuses applied, CHP price went from 4,200 CHP for 1 ETH, to 3,850 for 1 ETH, to finally, 3,500 CHP for 1 ETH. However, with regards to the current ETH price, we will be unable to keep these prices stated above because if we did, we wouldn’t be staying true to what we promised back in November. Everyone who participated in the Pre-ICO will without a doubt still be getting the best price, but we want this to be a welcoming community and a space for every player to enjoy poker. Yes, we want this project to succeed — and a big part of that is welcoming as many players as we possibly can. Sticking to our current price would start making CoinPoker more exclusive than we want it to be. While we understand people in cryptocurrency communities acquire tokens as a form of investment, we are about bringing back a game that we love back to its roots and rewiring it with new technology to make it what every player has dreamed it could be. Our ICO starts on 19th of January, which is why we will be confirming CHP prices on the 17th of January. We cannot release them earlier, because ETH value could still drastically change, and at the same time, we cannot wait until the last minute, because Smart Contracts require at least two days of work for the price to be processed and ready for the ICO. We genuinely hope that you understand our reasons for changing the CHP price for our ICO. In this short time after our Pre-ICO was finished, we have found ourselves in a wonderful community of people who are every bit as excited about the future as we are — and we don’t want to let anyone down to the best of our capabilities. That said, a lot of you were able to win CHiPs with no personal funds involved at all! Our 5,000,000 CHP freeroll tournaments were a booming success, so much in fact, that we have found ourselves with less than 1,300,000 CHP left to distribute. That means we’ll be cutting back on the amount of tournaments that we hold per day so that we can offer to win CHP up until the start of our ICO. Also, don’t forget our Tesla promotion — you can play in the satellites to acquire seats to the Main Event right now! On top of that, we’ll be holding HUGE opening tournaments once our ICO is done, along with a lot of other events. The future is grand, so we really hope to see you enjoying together with us!